Our assortment of fine tools for molecular biology is constantly growing. This new detection kit for HRP-conjugated antibodies offers a sensitivity far beyond anything known for a price you haven't even dreamed of! This non-toxic aqueous solution allows the enhancement of low-energy isotopes within acrylamide gels. Exposure times can thus be reduced significantly. Works better than other known products on the market! This single-solution staining kit combines the sensitivity of silver stain with speed end ease of use. Believe it or not - staining takes place in one single solution and is completed just 30 minutes after fixing. This widely unknown staining protocol beats everything in terms of speed. In just 10 minutes after detaching your gel plates you can document your gel! Sensitivity is close to silver and the staining is reversible! Apply your destained gel to whatever procedure you want. 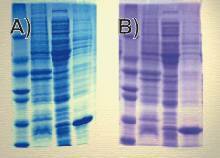 Coomassie staining is still the most common visualisation for protein SDS gels. This kit allows a very sensitive coomassie stain that requires no subsequent destaining! Get you results quicker (1 hour) and keep the odor and atmosphere in your lab clean. It's the classic colorimetric assay for measuring total protein concentration. Apart from a price that only we do offer, Bradford comes with a protocol that offers an increased linearity of OD to concentration ratio. Like other kits for purifying nucleic acids from agarose gels or solutions NuClean is based on the use of a powdered silica matrix. The price per reaction however is incomparable with other kits on the market! Comes with 4 ml of silica matrix suspension. We now offer our first vector. Due to its exceptional tightness this expression vector is especially suitable for the expression of toxic genes in E.coli. An optional C-terminal His-tag is included for easy purification of full-length only. This mounting medium for immunofluorescent microscopy substantially decreases bleaching of fluorochromes under UV radiation. Since it also solidifies on the slide the use of nail polish for slide fixation is history. Ever tried hot-start PCR to increase your specificity? T.Wax are easy-to-use wax beads that allow a contamination-free and reproductive application of this powerful method. NOWA is a highly sensitive detection system for HRP-conjugated antibodies in the picogramm range. The kit is based on the emission of light during a reaction which is started be free oxygen produced by the enzymatic activity of HRP. Using a newly developed enhancement cascade the light emission is amplified by a factor of at least one thousand. The NOWA kit contains two solutions that are combined and used to incubate the nitrocellulose or PVDF filter in. After one minute of incubation time the filter is ready to be exposed to an x-ray film. Typical exposure times range between 10 seconds and 5 minutes. The light emitting reaction continues for about 1 hour to allow as many exposures as you may need. The kit contains 2 x 250 ml and is sufficient for 10 000 cm2 (1 m2!) of NC or PVDF membrane resulting in a price of less than 0.50 EURO per mini gel blot! Schneppenheim, R. et al. 1991. 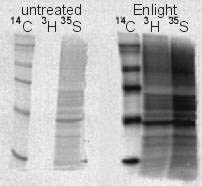 Luminography - a highly sensitive visualization method for electrophoresis. Electrophoresis. 12(5): 367-372. Enlight is a non-toxic aqueous solution that allows the fluorographic enhancement of low-energy isotopes in acrylamide and agarose gels. After electrophoresis the gel is soaked in the Enlight solution for one hour. The gel is then dried as usual and exposed to an x-ray film at -70�C. Low-energy electrons that can not leave the gel matrix (3H!) are likely to interact with fluorographic molecules that are now incorporated in the gel and stimulate a light-emitting process. These photons can easily leave the gel to expose the film. The increased detection efficiency for 3H is at least 10000 fold, for 14C, 35S and 33P at least 100 fold. Hence Enlight works better than other known products on the market! Saves time and money! for one hour befor drying. to film for 40 h @ -70�C. Silver Surfer combines the sensitivity of conventional silver staining with the speed and ease you've always been waiting for (see your bands 30 minutes after fixing). Whereas old protocols required multiple incubation, washing and development steps, Silver Surfer does it all in one single solution! Moreover contrast and sensitivity have been markedly improved in this kit (down to 200 pg!). While you got brownish bands on your gels until now, Silver Surfer generates a deep black staining color. The silver stain develops over a period of 10 - 20 minutes, to give you enough time to stop the reaction at the point of staining intensity you require. The reaction is stopped in standard fixing solution and gels can be dried and stored as usual. Silver Surfer is suitable for the staining of 2D and DNA gels as well. One kit is enough for 40 SDS mini gels. Snow White is a reversible, rapid negative stain for SDS PAGE gels. A simple two step staining procedure allows visualization of bands in just 10 minutes with a sensitivity equal to that of silver stain. Snow White produces an opaque white background with crystal clear protein bands that can easily be viewed and documented when placed against a dark background (e.g. UV screen). The destaining solution of the kit allows complete destaining of the gel in just 15 minutes. Gels can then be applied to subsequent procedures such as Western blotting, electroelution, amino acid analysis, N-terminal sequencing, MALDI-TOF... you name it! One kit stains 25 mini gels. Deep Blue is the easiest way to Coomassie stain your protein gels. It's sensitive, it doesn't smell, it's fast, and it's destain free! The equilibrium of the blue dye in Deep Blue is primarily driven towards its solid colloid state, leaving the solution almost colorless. 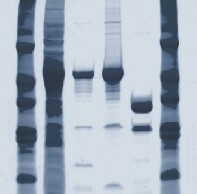 Proteins bands inside a gel accumulate these trace amounts of dye quickly and develop a dark blue stain while the rest of the gel remains clear. Watch your bands develop before your eyes, directly in the staining tray. After one hour the staining is complete and the gel can be dried directly. It is also possible to further increase the sensitivity of Deep Blue by an additional water wash step to detect even the weakest bands. Deep Blue offers the best results for the best price! The Bradford assay is a widely used and reliable method to determine protein concentrations in solutions in the range of 2 to 300 �g per assay (10 - 1500 �g/ml). It is easy to perform, rapid and very specific for proteins. We now offer this dye together with a protocol for increased linearity of OD to concentration ratio. The kit contains 500 ml of dye reagent, sufficient for 2500 assays in 1 ml cuvettes. NuClean is a quick and efficient system for the purification of single- and double-stranded DNA from solutions and agarose gels. The method is based on the high affinity of nucleic acids to the large surface of the silica particles in the presence of a chaotropic salt. After two washing steps the purified DNA can be eluted quantitatively in a small volume of water or TE buffer. No other purification for subsequent enzymatic procedures is necessary. Since DNA fragments <40 bp in size do not bind to the particles it is possible to separate DNA products from non-incorporated nucleotides and oligonucleotides from reaction mixtures. Striking features of NuClean are high purity of the product, minimal time needed for the procedure (<20 min) and an exceptionally low price! The product yield is between 60 and 80 %. One NuClean kit is sufficient for 400 purifications from TAE gels or 300 purifications from reaction solutions. NuClean II comes with an additional modification solution that allows the purification of DNA from TBE gels. 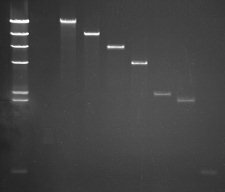 Isolation of DNA fragments from TAE and TBE gels. Purification of plasmids from E. coli lysates. Vogelstein, B. and Gillespie, D. 1979. Preparative and analytical purification of DNA from agarose. Proc. Natl. Acad. Sci. USA. 76(2): 615-619.
used for input of purification. The pEG-His1 vector was particularly constructed for the expression of toxic gene products in E. coli. To obtain its exceptional tightness prior induction with IPTG the Lac I repressor gene has been included in the vector and is overexpressed in plasmid bearing cells. An optimized promoter guarantees excellent expression levels. Very tight expression control due to overexpression of Lac I repressor. A convenient MCS allows flexible and easy cloning of the insert. Start codon is provided by an Nde I site. Inserts can be expressed as C-terminal tagged His6 fusion proteins for easy purification of full length proteins. RGS motive prior His tag allows detection and/or immunoprecipitation of the expressed protein with commercial anti-RGS antibodies. expressing the toxic protein EBNA2. GLOW is a mounting medium for immunofluorescence microscopy. Its new formula stabilizes fluorochromes and substantially decreases bleaching under UV radiation. This results in prolonged gleaming signals and higher contrast of the images. Another innovation of GLOW is its property to gently solidify after the attachment of the cover slide. This feature a) conserves the cells in their permanent appearance and b) permanently fixes the cover slide. Thus the use of "nail polish" for slide immobilisation is no longer necessary. These benefits make GLOW the tool of choice to get the finest images from your precious immuno-fluorescences. For your convenience GLOW comes in an easy-to-use pipet flask. after 0 & 3 mins with & without GLOW (no MM). T.Wax is a biologically inert wax with a melting point between 69-73�C. It comes in ready-to-use beads of 20 mg (30 �l) to allow a contamination-free and easy handling. By using T.Wax instead of mineral oil it is possible to apply an easy and reproducible protocol for hot-start PCR. In the first step all PCR components except for Taq-polymerase are provided with a T.Wax bead, briefly heated to 95�C and then cooled to room temperature. The wax now forms a solid barrier on top of the reaction mixture. In the second step the Taq-polymerase is added on top of this barrier. During the first denaturation step in the cycler the wax melts again and allows the enzyme to fall through the liquid wax. That way the first contact of the Taq-polymerase and the other reaction components takes place at 95�C, preventing misannealing and the amplification of unwanted fragments. After the amplification the wax barrier can easily be pierced with a pipet tip to remove the reaction mix without oil contaminations. T.Wax beads are suitable for 200 �l and 500 �l reaction tubes and a reaction volume of up to 100 �l. Of course T.Wax is absolutely DNA- and RNA-free! Bassam, et al. 1993. Automated Hot Start PCR using minerat oil and paraffin wax. BioTechniques. 14(1):30-34.